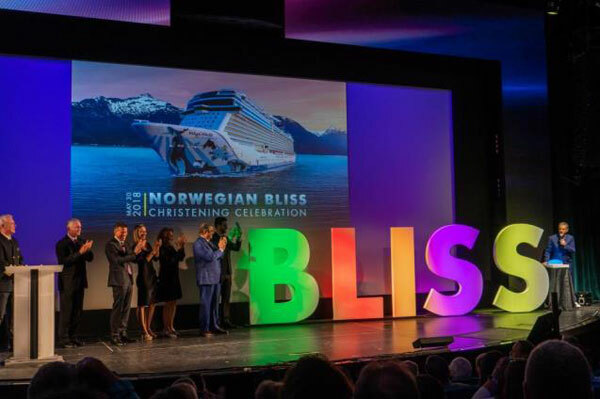 On May 31, Norwegian Cruise Line (NCL) executed an industry first event with the christening of Norwegian Bliss in Seattle broadcasted throughout the ship’s multiple venues to the more than 2,500 guests in attendance. On board talent also participated in the day’s events with performances by the Jersey Boys, ¡HAVANA! and the Beatles cover band, with each venue hosted by Norwegian cruise directors and members of Elvis Duran and The Morning Show. Norwegian Bliss offers seven-day voyages to Alaska from Seattle this summer and then in October will sail select voyages to the Mexican Riviera from Los Angeles.